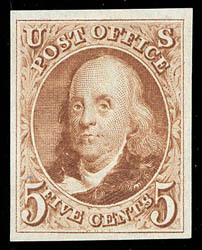 1847 (1875 Reproduction), 5¢ red brown, large margins, bright and fresh, without gum as issued, choice and Very Fine, ex-H.R. Harmer, Jan. 12th 1959 lot 29. A link back to Sale 75 - Lot 630, along with its description, will be appended to your message.